Spring marathon season reaches full bloom in Boston and London over the next two weeks. Lining up in Hopkinton alongside the A-list from the USA (Shalane, Molly Huddle, Jordan Hasay, Desi Linden, Galen Rupp) will be Gene Dykes, who Gregg interviews in Episode 63. 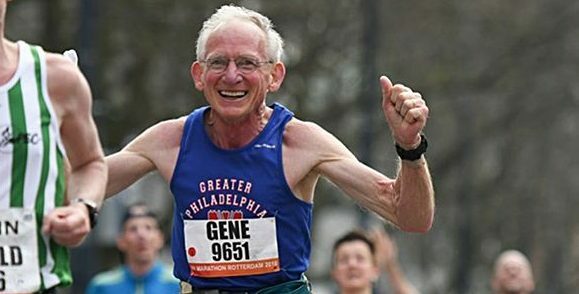 Gene became the world’s second septuagenarian under 3 hours and set a seven-minute personal best when he ran 2:57:43 at last weekend’s Rotterdam Marathon. To Boylston Street we ready, set, go! Awesome interview with Gene Dykes! Love the idea that running isn’t only a young person’s sport – something that gets lost sometimes. Maybe one day I will be leaving a bottle of diluted coke 6 miles before the finish line. Great work, guys. Thanks Dana! Gregg did a great job with that one, and Gene is remarkable. I’m curious about the 200 mile races. I mean, how on earth…? It must be deeply enjoyable on a certain level. With respect to 200’s, the fatigue can get profound, and the sleep deprivation is awful, but the total immersion in stunning scenery and the journey from one point to another, a point that starts out seeming an unfathomable distance away, will haunt you forever, but only in the very best way. It was a WR for age 70 specifically. Whitlock ran 2:54 at age 73, so Whitlock has record if you are looking at the 70-74 AG. There is no such thing as a marathon “WR for age 70.” The age group is M70 which consists of male athletes who have reached the age of 70 but have not yet reached the age of 75, so exactly from their 70th birthday to the day before their 75th birthday. Yes, it’s nitpicky and I’m not trying to criticize Gene Dykes accomplishments. However, if Masters running is to be properly recorded and taken seriously, the rules must be adhered to. Hi Bob: I suppose it depends on the source but I think it is a world record. ARRS calls them world records for each age. But anyway, taking a step back I can see how it would be misleading because someone might assume it’s a 70+ world record. Fair enough. I just didn’t mention Whitlock for brevity’s sake. Will do so in the future. Truly incredible. Gene, how many miles per week do you typically average when you aren’t racing on the weekend?